One of my favorite ways to relax is seeing how others tire themselves. Especially when they do it in a spectacular way. 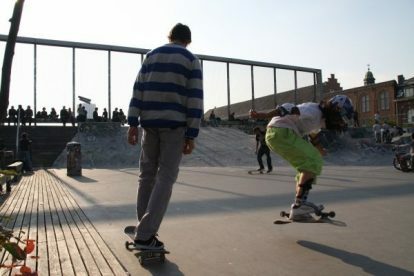 Take your drinks with you and climb the steps of the skate-ramp. There you can sit and relax on the bench, enjoying the sun while the youth is giving away a free stunt show, right at the place where the trains disappear a few meters below into the Brussels underground. Looking for some action? Bring your own skateboard or bmx and be an acrobat yourself. The place is free and accessible to everyone.